“No, this is not a happy Mother’s Day!” said Fatima Brijea as she pointed to the framed photograph behind me. It was her son. 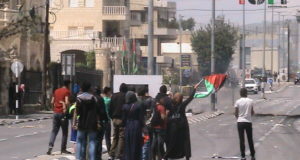 He was assassinated by the Israeli army. I sat in her living room sipping tea. I noticed the strength of Fatima’s hands as she poured my sweet tea. She is a farmer and has been all her life. Her greenhouses are lush with vegetables and the view from her yard is breathtaking. One is rendered speechless, however, when you stroll a few kilometers away to find US sponsored Caterpillar bulldozers ripping apart Fatima’s land and others like her. 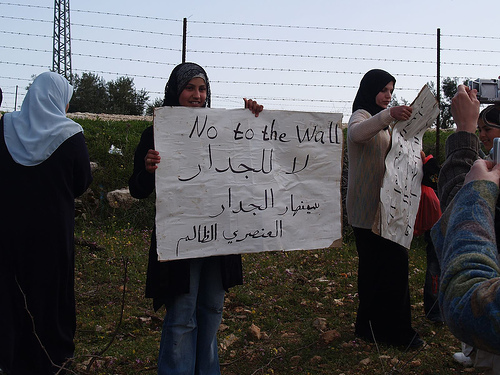 Israel’s Apartheid wall, like all over the West Bank, is snaking through the land and separating farmers from their farmland, school kids from their schools, patients from their hospitals. 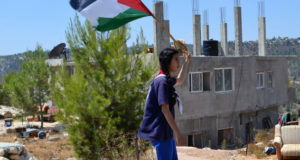 And here, in Um Salamuna, things are starting to resemble places like Qalqilya and Bethlehem, where an 8-meter high wall, the most atrocious eye sore in the most beautiful of lands, is thieving the most precious of things from the Palestinians– their land. So yesterday was Mother’s Day. It was also the UN International Day for the Elimination of Discrimination. It is observed annually on 21 March. On that day, in 1960, police opened fire and killed 69 people at a peaceful demonstration in Sharpeville, South Africa, against the apartheid “pass laws”. Proclaiming the Day in 1966, the General Assembly called on the international community to redouble its efforts to eliminate all forms of racial discrimination. 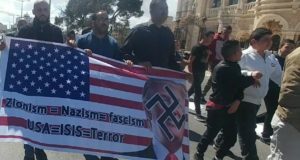 And that is what was happening yesterday– peacefully protesting against Israel’s system of Apartheid, protesting peacefully against Israel’s discriminatory practices. Fatima is the leader of the Um Salamuna Women’s Organization. Other women from the Organization marched in solidarity with other Palestinians, Israeli, and international human rights groups. The demonstrators marched towards the construction site. Agricultural memories of ancient times were disintegrating into nothingness as the bulldozers tore away at Mother Earth, scattering her ashes in all directions, carelessly, angrily. Fatima thanked the participants, the media, and all the internationals for joining in on the struggle. Not a single rock was thrown by the Palestinians at their colonizers, their Occupiers. The women decided to call off any further marching to the Wall. And as the crowd made their way up the farmland, the bulldozers started back to work at killing the Earth, making way for the continuation of over 500 miles of concrete, equipped with motion sensors and sniper towers- a huge wall, built by Israel out of racial discrimination, an Apartheid state that holds one group of people over another. No. It was not a happy Mother’s Day.